is the exclusive online sales and marketing agent for the product. 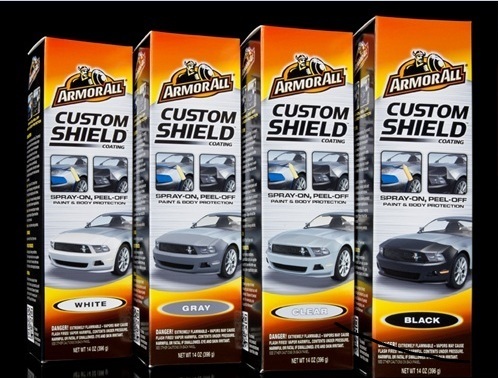 Armor All Custom Shield Coating is an innovative temporary, spray on, peel off coating that allows consumers to protect their vehicle’s paint and body from the elements. It comes in a variety of colors so consumers can create a temporary custom look. For instance, they can add racing stripes down the center of the car, or show their spirit by putting their favorite sports team’s colors on the hood. Armor All Custom Shield Coating kits and individual cans are available for sale online at www.AACustomshield.com. The website includes images and videos of the product in use, as well as application and removal instructions plus helpful tips and tricks to make the application process even easier. It will be available for sale at retail outlets nationwide in the spring of 2013. Starter kits are available for $24.99 and individual cans are available for $16.99 ($14.99 if you purchase three or more cans). Free shipping is also available for all orders above $50 or if the order contains three or more cans. For more information about Armor All products visit www.armorall.com; you can also visit them on Facebook: www.Facebook.com/ArmorAll. For more information about Armor All Custom Shield Coating, visit www.AACustomshield.com. Click here to read the original press release. | © 2019 GameChanger Products. All Rights Reserved.